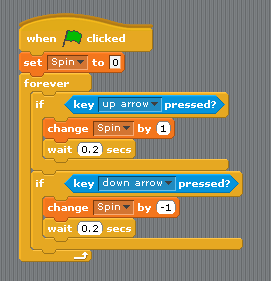 ← CoderDojo Athenry: Introduction to our Second Season! Movies are lots of single pictures shown very quickly one after the other. Most movies run at 24 pictures a second!! 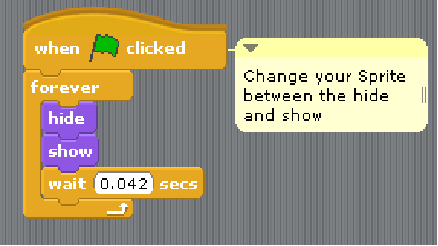 We can do the same in Scratch. Question: If there are 24 pictures in one second, how long is each picture shown for? So what kind of Sprite are we going to have and how will it move? Well for this demonstration we are going to use a Wheel, it can be of any style, but one with spokes works best to demonstrate the Wagon Wheel effect. Wheels, are circular 🙂 and circles have 360 degrees, if a wheel turns a full 360 degrees between each frame, then it will appear to stand still. Some more Maths! Depending upon the number of Spokes in your wheel you can get different effects. Lets start with one Spoke! And to make things interesting we will create avariable so we can turn it by different degrees quite easily. So we set it up to recieve the broadcast from the Movie Machine and turn round by a certain amount each time. In the example above I have used the variable, but you don’t have to you can just put in a number. 90 – what do you see? 180 – what do you see? 360 – what do you see? And if you want to get real fancy and use a variable, you can add the variable, and the following code to adjust whilst the program is running.